be manipulated for direction, length, opacity and the amount of spread that is applied across a matrix. This simple engine can be used to create almost any type of moving colour transitions on an array of fixtures. The opacity feature of the PaintBox effects provides the ability to blind the effect with underlying colours set by cues, groups or any other subsystem of the software. Version 2.19 introduces a more stramlined approach to saving and loading shows. The show will always be safe and these changes further enhance the security of the show file to protect it against unintended changes. The current show in the active memory of the console will always be up to date and it will be retained even if the console is powered off. These new changes allow saving copies of the show file while maintaining an archive of the data as needed. NEO show files have a new extension of .NEO. Starting a new show - When a new show is started, if there is a show file in the console’s active memory and it has been changed, there will be a prompt to save it. If the showfile has not changed, then a new show file will be started immediately. Loading a show - Prior to loading a show file, a prompt will appear to save the existing show file before the selected show is loaded into the NEO’s Current Show. When a prior show is opened (.FDB), a prompt will appear allowing NEO to convert it to the new format (.NEO). A show file can now be loaded directly from an external drive or USB drive without any prior need to copy it to the console. Saving a show - If changes to a show file have been made, an archive copy is created at the moment the saving occurs. It is then safely stored away, allowing a restoration back to that version at any time. The show remains in active memory regardless allowing continued work on the file. "Save As" - This is identical to saving a show except that it’s under a different name. 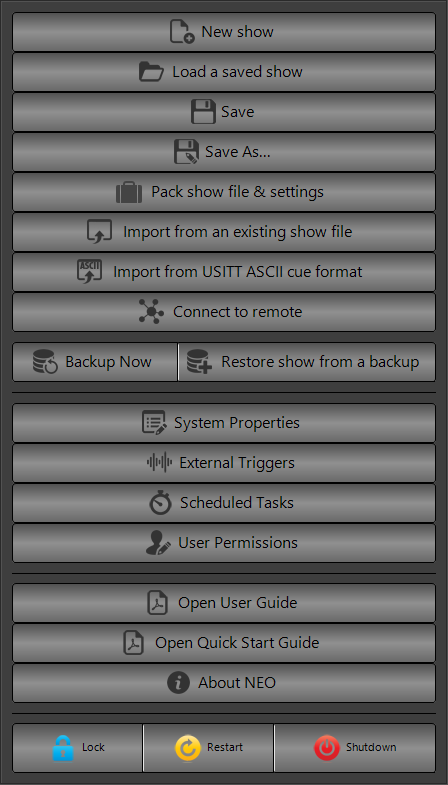 This is especially useful for keeping multiple copies of the show file to be able to go back to earlier versions. Packed Shows - In addition to the options above a new "Packed" show file system allows you to pack all output configuration, system settings, media files and mobile layouts into a single file to make it easier to transfer a show between systems. Open Sound Control (OSC) is a protocol for communication among computers, sound synthesizers, and other multimedia devices that is optimized for modern networking technology. Bringing the benefits of modern networking technology to the world of electronic musical instruments, OSC's advantages include interoperability, accuracy, flexibility, and enhanced organization and documentation. The latest version supports bi-directional OSC messages for both controlling OSC devices and being controlled by an OSC source. Prior to V2.19, a specific palette could only be applied to the fixtures (or a subset thereof) that are stored in the palette. 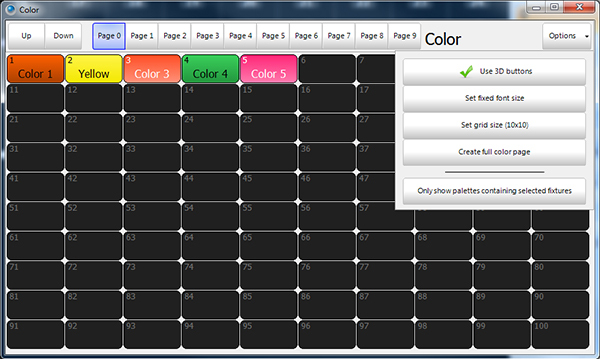 V2.19 introduces the concept of virtual palettes which in effect allow specific palettes to act like generic palettes. This a specifric palette is applied to a fixture not recorded into the palette the system will attempt to do a best match to apply the palette by first looking for a fixture of the same time and then falling back to a generic tranlation of the palette data.